To answer the above question, well, if you speak to users of infrared mats, or read their online reviews, it appears that most users are happy with their particular mat. It depends so much for what cause you use an infrared mat and what your personal situation is, which makes bad or excellent experience with a certain mat quite personal. What far Infrared mats have in common, is that it produces negative ions and pulsed electromagnetic fields (PEMF) for healing energy. - Also good for pets. 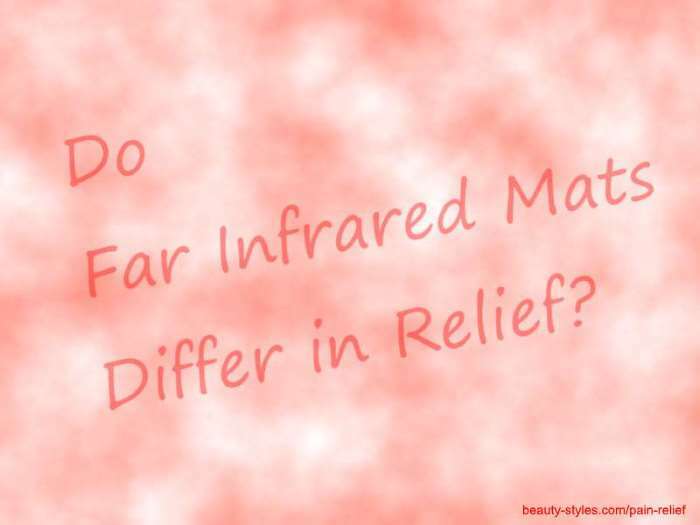 You might want to read here a study on Far InfraRed Light for chronic back pain or one on chronic pain, chronic fatigue syndrome, and fibromyalgia. The far infrared technology of the mats is more or less similar. The layers with crystals such as amethist and jade, and the thickness of the mats however, may differ. Usually a thicker mat has more layers. Below, you'll find images and links to Amazon for more information and where you can read through the reviews which is quite informative. HealthyLine Inframat Pro - Rainbow Mat - well-rated. You'll also see there the sizes: Medium= 50" x 24" and Large= 74" x 28"
Ereada Far Infrared Amethyst Mat - popular and great-rated! You'll also see there the sizes: Compact Pro= 59" x 24" and Queen= 75" x 59"
Medicrystal Classic Amethyst Mat - popular and great-rated! You'll also see there the sizes: Midsize= 59" x 24" and Single= 75" x 39"
Charmed Far Infrared Heating Mat - popular and great-rated! You'll also see here Professional Size 26.5" X 71"
UTK Far Infrared Heating Mat - very popular and great-rated! You'll also see here Small Pro Size 23.5" X 16"
and here's Medium T-Plus Size 38" X 21"
Tendlite Review - Does It Work? Supplements for Pain Relief such as PodiVite for foot pain, VitaBack for back and joint pain and WoundVite for healing wounds.